Department of Spine Surgery, Oyster and pearl hospital, India. Material and Methods: All patients aged more than 60 years presenting with intractable back pain with or without neurological deficit were screened. Of the 532 patients, 274 osteoporotic insufficiency fractures were identified by DEXA scan and excluded from the analysis. 258 patients with vertebral collapse caused by infection or neoplastic conditions were included in study. Keywords: Thoracolumbar fractures, pathological fractures, biopsy. Atraumatic vertebral collapse is a common clinical problem, especially in elderly population (1). It includes fractures because of osteoporosis or any other pathological cause. Pathological vertebral fracture in elderly occurs due to infective or neoplastic condition. Spinal column affection by neoplastic lesions include primary (benign or malignant ) or secondary metastasis. 50 to 85% of patients with cancer experience skeletal metastasis, most commonly in the spine (2). Infection of spine occurs due to tuberculosis, atypical tuberculosis, pyogenic, fungal and parasitic infestation (e.g.hydatid cyst). Tuberculosis is most common among them and a major health problem in developing countries. In elderly population because of comorbidity and lower immunity, spinal affection by tuberculosis is high. The spine has a load-bearing and a neuro-protective function, Any failure of its structural integrity as a result of metastatic or infective vertebral involvement often brings about severe pain and/or paralysis. These symptoms impair the ambulatory ability of the patients and worsen their quality of life. One of the main causes of severe pain or paralysis is pathologic vertebral body collapse caused by an osteolytic lesion. Therefore, prevention and treatment of collapse is a key factor in maintaining the patients’ ambulatory ability especially in morbid elderly population (3,4,5,6). Early diagnosis of such conditions is very important to start with proper treatment. Diagnosis of pathological vertebral collapse in aged population is usually missed or delayed. Elderly patients presenting with backache and vertebral collapse are a challenge for diagnosis as well as for management. Correct diagnosis may require all blood invastigations and imaging modalities including plain X-rays, ultrasonography (USG), computed tomography (CT), radionuclide bone scan, magnetic resonance imaging (MRI) and PET scan. For conclusive diagnosis one needs to identify the causative organism and know histopathology of the lesion by biopsy. One may need to repeat the biopsy if required before starting any treatment. It is mandatory to do a culture and test the sensitivity to rule out drug resistance in case of spinal tuberculosis. Management depends on multiple factors and requires multidisciplinary approach. While many studies have investigated osteoporotic vertebral collapse in the elderly, not many have reported on other pathological fractures. We present our series of such patients and propose a treatment and management algorithm. All patients aged more than 60 years presenting with intractable back pain with or without neurological deficit were identified from a data base spanning seven and half years (May 2008 to Nov 2015 ) at a tertiary care hospital. Of the 532 patients, 274 osteoporotic insufficiency fractures were identified by DEXA scan and excluded from the analysis. 258 patients with vertebral collapse caused by infection or neoplastic conditions were included in study. The patients were classified according to age, gender, pathology, levels affected, region involved, neurological deficit, type of biopsy and management protocol. Base line haematological tests included haemogram, liver function test (LFT), renal function test (RFT), CRP, ESR and serum electrophoresis studies. Radiological studies included Xrays of the affected region ( anteroposterior & lateral views ) and MRI were done in all cases. CT scan, Bone scan, PET scan and Bone marrow examination were done in indicated cases. Tissue diagnosis was done by biopsy in all cases for histopathology and/or culture sensitivity. Management protocol was decided according to the pathology and severity of the lesions. All patients were followed up at regular intervals 3 months, 6 months, 12 months and yearly follow up after that. The cohort included 258 patients (Male 156: Female 102) aged between 60 and 82 years age (mean age 63.4 years). 212 patients (82.2%) had a single vertebral lesion followed by 34 (13.2%) at 2 levels and 12 (4.7%) with multiple vertebral levels involved. 161 cases (62.9%) had an infective pathology while the remaining 97 (37.9%) had a neoplastic cause. Out of 258 patients mean aged 63.4 years ( 60-82 years ), we found 156 male and 102 female patients. Level of involvement was found to be single, double and multiple in 212 (82.17%), 34 (13.17%) and 12 (4.65%) cases respectively. Infective pathology was found in 161(62.89%) and neoplastic cause was found in 97(37.89%) cases. Distribution of pathology and level affected are detailed in Table 1. Out of 258, 234 patients presented with intractable pain[predominant back pain in 198 (76.74%) and predominant extremity pain in 62 (24.03%) patients ] of mean duration8.2 weeks ( 1- 32weeks). 68 (26.35%) patients presented with neuro deficit( Frankel grade B in 3, C in 14 and D in 51 ). Constitutional symptoms were present in 38 (14.72) patients. Spinal deformity was present in 21 cases. Biopsy: Diagnosis of pathological vertebral fracture in elderly age group is usually delayed but sometimes it may be wrongly diagnosed or even missed. Tissue diagnosis is mandatory in all cases. Needle biopsy using Jamshidi needle was done in all suspicious vertebral pathology. Biopsy material was sent for gram stain, Ziehl-Nielson stain, Pus culture and sensitivity, and histopathological examination. Acid fast bacteria culture was advised in relevant cases ( not responding to treatment and MDR Tb ). Gene expert study ( PCR ) for tuberculosis was done in last 2 years only. Needle biopsy was positive in 218 ( 84.49% ) cases. Repeat biopsy was required in 39 cases where Fine Needle Aspiration Cytology (FNAC) was inconclusive. Core biopsy was done in all these 39 cases using large bore Jamshidi needle and it showed malignancy in 19 cases and tuberculosis in 20 cases. In 11patients who had an unbiopsied vertebral lesion initially as primary lesion was confirmed, and not responding to chemotherapy or radiotherapy, a subsequent vertebral biopsy was done. 5 of these patients were diagnosed to have a tuberculous lesion. 27 vertebral collapse initially thought to be osteoporotic on radiological imaging ( MRI and DEXA ) but not responding to osteoporotic treatment were reevaluated by biopsy and turned out to be Koch’s spine in 21 cases and neoplastic in 6 cases. 17 patients who were put on AKT for Koch’s spine but not responding were reevaluated by biopsy and report turned out to be malignant lesion. 60 patients (58 TB spine and 2 pyogenic infection) were managed without surgery and the remainder 197 patients underwent surgical intervention. Non surgical management comprised of bed rest, analgesics, bracing, anti microbial regimen according to pathogen in case of infective lesions. The 58 patients of tubercular spondylitis were treated by ATT, 4 drug regimen ( Rifampicin, Isoniazide, Ethambutol, Pyrazinamide ) for 3 months, 3 drugs for 3 months, 2 drugs for 3 months. In 2 cases of pyogenic osteomyelitis culture sensitivity specific antibiotics were given intravenously for 2-3 weeks followed by orally for 6 weeks. CBC, CRP, ESR, LFT and RFT were done at regular interval to modify the dosage in all these old age patients. In MDR cases second line drug therapy was administered and monitored by the Infectious disease specialist. 101 infective lesions were managed surgically ( 92 primary and 9 revision ). 53 patients of spinal tuberculosis were operated by posterior decompression and fixation. 28 patients underwent surgery by posterolateral extrapleural approach and anteroposterior reconstruction. 13 patients were operated by anterior approach for decompression and reconstruction. 7 patients required a combined surgery and reconstruction by anterior and posterior approaches. All 97 neoplastic vertebral lesions required surgical intervention. Out of 24 primary malignant lesions 3 (out of 7) solitary plasmacytoma were removed enblock, rest all 21 cases were managed by intralesional removal of tumor mass. Pre operative embolisation was done in all vascular tumors ( Solitar plasmacytoma and spindle cell sarcoma ). 1 multiple myeloma and 2 implant related complications required revision surgery. Out of 73 metastatic vertebral lesions, Vertebroplasty was done in 29 patients, kyphoplasty was done in 6 cases and surgery was done in 38 cases. En block removal was done in 4 patients while in rest 34 cases intralesional removal of tumor was done. Pre operative embolisation was done in all 38 operated cases. 7 cervical and 9 thoracolumbar lesions were operated by anterior approach, 13 thoracolumbar and lumbar lesions were operated by posterior approach, while 9 cases of thoracolumbar and lumbar lesions were dealt by combination of both anterior as well as posterior approach. All 38 operated cases of vertebral metastases were stabilized by at least 2 levels above and 2 levels below with cementation of involved vertebra in posterior approach and anterior reconstruction using cage with autograft. Chemotherapy and/or radiotherapy was administered according to neoplastic pathology. Post operatively all malignant cases were put on bisphosphonate therapy. Complications: 4 out of 197 surgically operated elderly morbid patients died in the perioperative period. Neurological and / or functional improvement was seen in 185 operated cases. Frankel grade B 3 patients improved to grade C in 1 and grade d in 2 cases. Frankel grade c 14 cases showed no improvement in 3 cases, 9 improved to grade D and 2 improved to grade E. Out of 51 Frankel grade D, 4 patients didn’t show much improvement but 37 fully recovered. Operated Koch’s spine all patients showed neurological improvement. Mean survival time in primary malignancy cases was 36.2 months, while in metastatic cases it was 14.3 months. 7 patients developed recurrence at same level after mean time of 9 months, out of those 2 patients developed paraplegia. Atraumatic vertebral collapse is a common clinical problem, especially in elderly population (1). Osteoporotic vertebral fracture is the major cause in such elderly population. The prevalence of osteoporotic vertebral fractures varied from about 3% in the age group below 60 to about 19% in the 70+ group in women, and from 7.5% to about 20% in men, with an overall prevalence of 11.8% in women and 13.8% in men (7). Among other causes of pathological collapse in the elderly, infective lesions are also common with neoplastic lesions being on the higher side. A fairly high index of suspicion is necessary when dealing with vertebral collapses in the elderly population. Infection of spine is still a mojor health issue in developing countries. Poor hygiene, poverty, unawareness, poor ventilation along with that other co-morbidities make elderly individual more prone for the infection especially tubercular in developing countries. With ageing bony trabeculae becomes weak and osteoporotic vertebral collapse become more prevalent. Because the spine has a load-bearing and a nerve-protecting function, failure of its structural integrity as a result of pathological vertebral involvement often brings about severe pain and/or paralysis. These symptoms impair the ambulatory ability of the patients and worsen their quality of life. One of the main causes of severe pain or paralysis is pathologic vertebral body collapse caused by an osteolytic lesion. Therefore, prevention and treatment of collapse is a key factor in maintaining the patients’ ambulatory ability especially in morbid elderly population (3,4,5,6). So early diagnosis of such conditions is very important to start with proper treatment. Tan DY et al., studied 58 vertebral collapse out of which he found 36 benign vertebral collapses (20 osteoporotic, 7 post-traumatic, 9 infective) and 22 malignant ones (20 metastatic carcinoma, 2 multiple myeloma). In our study we found Infective pathology in 161 (62.89%) [ 13 pyogenic, 130 tubercular, 7 atypical tubercular, 5 MDR tubercular, 2 fungal, 4 hydatid cyst ] and neoplastic lesions in 97 (37.89%) [ 24 primary malignant ( 13 multiple myeloma, 7 solitary plasmacyetoma, 3 lymphoma, 1 spindle cell sarcoma ) and 73 metastases ].The most frequent spinal metastases (60%) are from breast, lung, or prostate cancer (15). Any elderly patient presenting with intractable back pain especially at night, weight loss and other constitutional symptoms without any history of trivial injury then think of pathological vertebral lesion. Any vertebral collapse detected on a radiograph must initially undergo MRI and routine blood investigations, followed by a DEXA scan to rule out osteoporosis. Even though DEXA scan is indicating osteoporosis it doesn’t always rule out infection or malignancy. In our study we found 27 patients with osteoporotic vertebral collapse, who didn’t respond to osteoporotic treatment and later on confirmed by biopsy as malignancy in 6 cases and infection in 21 cases. Typical spinal tuberculosis affects the continuous vertebral levels and causes narrowing of the adjacent disc space and bone destruction (8). However, Atypical tuberculous spondylitis shows spondylitis without discitis, isolated central lesion in single vertebral body, non-contiguous skip vertebral body lesions, isolated posterior vertebral elements involvement and isolated intraspinal canal lesions. Atypical form of spinal tuberculosis is difficult to distinguish from malignancy, leading to misdiagnosis and inadequate treatment. Pyogenic and fungal spondylitis, sarcoidosis, metastasis and lymphoma are the close differential diagnosis for tuberculous spondylitis (10, 11). Differentiating tuberculous spondylitis from these conditions is very important since the line of management completely differs and also early intervention helps in minimizing the residual spinal deformity and permanent neurological deficits (12). Tan DY et al. stated that features which pointed to malignant cause were hypointense marrow on T1-weighted images, marrow enhancement after intravenous contrast, greater than 50% marrow involvement and involvement of posterior elements. Of the vertebral collapses due to infection, 78% showed end-plate disruption(14). Image guided biopsy is very helpful for early diagnosis and prompt intervention if the clinical and imaging findings are not very helpful arriving diagnosis, especially with the atypical presentations (13). Biopsy: Diagnosis of pathological vertebral fracture in elderly age group is usually delayed but sometimes it may be wrongly diagnosed or even missed. Tissue diagnosis is mandatory in all cases. Needle biopsy is the procedure of choice in definitive diagnosis of pathologic lesions of the spine (17). Needle biopsy is positive in 65% for lytic lesions, incisional biopsy is useful in 85% of blastic lesion while excisional biopsy is positive in >85% for posterior lesions and benign tumors. The percentage of positive results of biopsy are higher in metastases than primary tumors. The cystic and sclerotic vertebral tumors have less positive results. Transpedicular biopsy with Jamshidi needle has better success rate than FNAB in such lesions. Once tissue diagnosis is done by biopsy then one should go ahead with other investigations such as CRP, ESR, Procalcitonin for infective pathology. For Neoplastic lesions one should do specific tumor markers and screening of whole body to rule out metastases elsewhere. All Patients with spinal tuberculosis are started on antituberculosis treatment as Tuberculous spondylodiscitis is primary medical problem. Surgery reserved only for the patients with complications or potential complications (9). Only the patients who had lost neurological power to Frankel grade A,B,C,D or with sphincter involvement were advised surgery. 11 patients who did not show good response to ATT after 3 months were also operated. 17 patients who had progressive kyphosis and instability due to more than 2 vertebral level involvement were also advised surgery. Operative management gives satisfactory results in elderly patients with tuberculous spondylodiscitis (21). Single level involvement of spinal tuberculosis can be very well dealt by posterior approach only ( Transpedicular decompression, 2 level above and 2 level below fixation and shortening). The posterior approach provides adequate exposure for decompression and rigid fixation, providing satisfactory clinical and radiological outcomes (21). 2 level involvement requires pasterolateral extraplueral approach for decompression and reconstruction ( 3 or 4 level above and below ). In case of more than 2 levels are involved one should think of anterior or anterior and posterior approach for thorough decompression and stabilization of segment involved. The pathological fractures due to neoplastic inlvolvement require a thorough check up to determine the general condition of the patient, staging and grading of the tumor, life expectancy , anticipated hospital and ICU stay etc. The indications for surgery for primary lesions are neurological deficit, instability, intratctable pain, radioresistant tumor and not sensitive to chemotherapy. The metastatic lesion may need surgery for severe pain, progressive neurogical deficit, instability affecting ambulatory ability or solitary metastases where in complete excision may be advocated. The decision of surgery in malignant or metastatic lesion is taken only if the general condition allows the patient to recover without significant postoperative morbidity or ICU stay. Vertebroplasty or kyphoplasty is the modality used in such inoperable painful collapse. Transpedicle body augmenter Vertebroplasty proved to be safe and effective in reducing pain andimproving functional status of patients with spinal tumor (18). Percutaneous Vertebroplasty (PVP) can be an effective treatment for metastatic spinal tumors in patients even with posterior wall deficiency (16). Takayuki Yamashita stated that palliative surgery benefited half of the patients with metastatic spinal tumor, with a greater probability of benefit found in persons with a higher total revised Tokuhashi score (score 9–15) and/or primary cancers with longer survival times (19). The modified Tokuhashi scoring system is used to decide the operability of the tumor. The type of surgery and approach is decided depending upon primary or metastasis, extent of involvement of vertebra (Tomita classification) and expected morbidity of the surgery. The response of the tumor to radiotherapy and chemotherapy is also an important factor in management. David W. Polly et al concluded that there is a strong recommendation for posterior or posterolateral approach from T2 through T5. For the T6–L5 regions of the spine we recommend either anterior, posterior, or combined anterior and posterior surgery depending on the clinical presentation, surgeon and patient preference (20). Hormonal treatment and immunotherapy may play an important role in certain tumors like Ca breast, ovary. In some inoperable tumors management to control pain is very important. The pathological fractures in elderly can be managed by the following algorithms. 1. Cicala D, Briganti F, Casale L, et al. Atraumatic vertebral compression fractures: differential diagnosis between benignosteoporotic and malignant fractures by MRI. MusculoskeletSurg 2013;97(Suppl. 2):169–79. 8. Naim-Ur-Rahman, El-Bakry A, Jamjoom A, et al. Atypical forms of spinal tuberculosis: case report and review of the literature. Surg Neurol. 1999;51(6):602- 07. 9. Rasouli MR, Mirkoohi M, Vaccaro AR, Yarandi KK, Rahimi-Movaghar V. Spinal Tuberculosis: Diagnosis and Management. Asian Spine J. 2012;6(4):294–308. 10. Jung NY, Jee WH, Ha KY, Park CK, Byun JY. Discrimination of tuberculous spondylitis from pyogenic spondylitis on MRI. AJR Am J Roentgenol. 2004;182(6):1405-10. 11. Khattry N, Thulkar S, Das A, Alan Khan S, Bakhshi S. Spinal tuberculosis mimicking malignancy: Atypical imaging features. Indian J Paediatr. 2007;74(3):297-8. PMID: 17401273. 12. Moore SL, Rafii M. Imaging of musculoskeletal and spinal tuberculosis. RadiolClin North Am. 2001;39(2):329-42. 13. Momjian R, George M. Atypical Imaging Features of Tuberculous Spondylitis: Case Report with Literature Review. J Radiol Case Rep. 2014;8(11):1–14. 17. J. Tehranzadeh, C. Tao & C. A. Browning (2007) Percutaneous Needle Biopsy of the Spine, Acta Radiologica, 48:8, 860-868. 18. Anna F-Y. Li, Kung-Chia Li, Fang-Yuan Chang and Ching-Hsiang Hsieh. Preliminary Report of Transpedicle Body Augmenter Vertebroplasty in Painful Vertebral Tumors. SPINE Volume 31, Number 21, pp E805–E812 ©2006. 20. David W. Polly, Jr, Dean Chou et al. 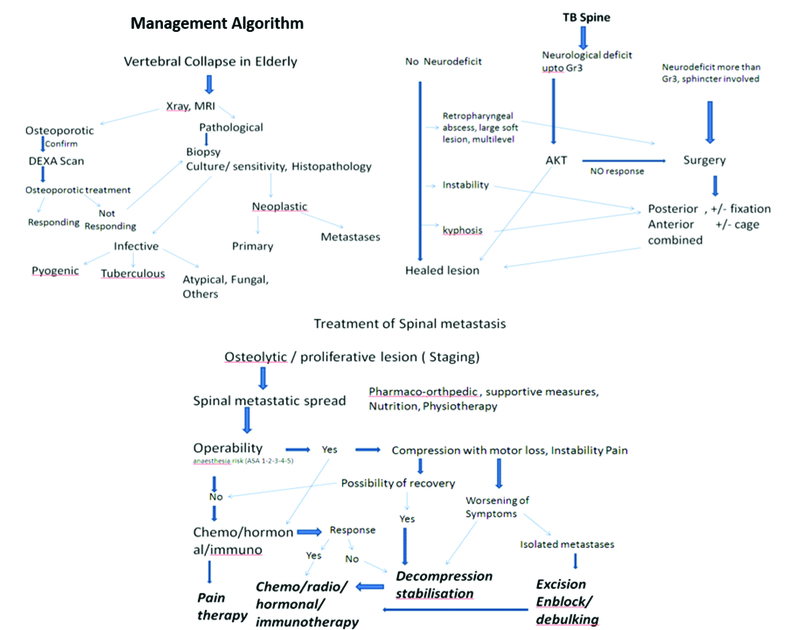 An Analysis of Decision Making and Treatment in Thoracolumbar Metastases. SPINE Volume 34, Number 22S, pp S118–S127 ©2009. 21. Manish Kothari, Kunal Shah, Agnivesh Tikoo, Abhay Nene. Short to Mid-Term Term Surgical Outcome Study with Posterior Only Approach on Tuberculous Spondylodiscitis in an Elderly Population. Asian Spine J 2016;10(2):258-266. How to Cite this Article: Parasnis R, Thumbadiya A, Pathak S, Patil S. Management of Pathological vertebral collapse in elderly. 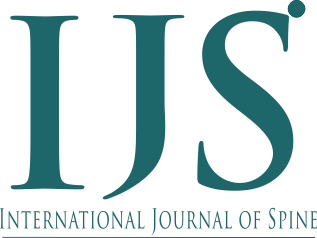 International Journal of Spine Sep-Dec 2016;1(2):22-26.